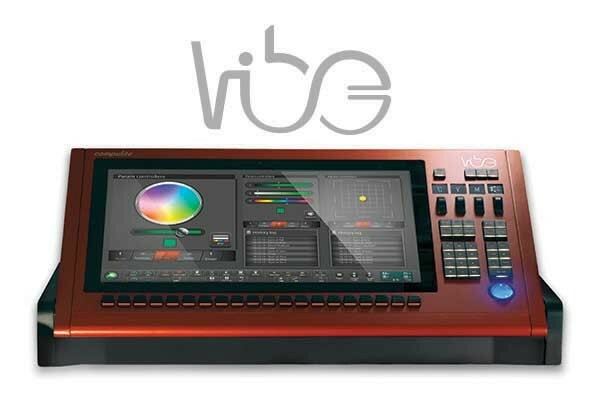 The PLASA show 2013 saw the launch of the new Compulite Vibe lighting console. 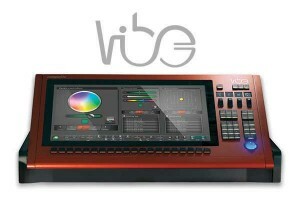 Vibe is a completely new concept in lighting control integrating conventional buttons and wheels with an innovative and dynamic touch screen based graphical user interface incorporating the latest computer and touch screen technology in an ergonomic and adjustable control surface. We are all familiar with the touch screen environment on our smart phones and tablets and Vibe brings this kind of intuitive interface to the lighting control market. You don’t have to read a manual to learn how to use your phone; neither should you with your lighting console. Vibe is syntax free and will prompt the user to enter any information they have missed. Vibe has the minimum amount of physical buttons with the touch screen environment giving the user the flexibility to layout his desktop exactly how he wants it with buttons, display windows and playbacks wherever he wants them. Different desktops can be configured for different parts of the show or for different users. There are no theoretical limits to the number of playbacks of desktop layouts; the user is not constrained by conventional physical hardware, and he can design his own control surface to suit the needs of the show and his creativity. Compulite's CEO Yehuda Shukrun commented: "It’s been 35 years when Compulite launched its first lighting console based on Microcontroller and a few years after her first moving light console in the world. Our products innovations always served and will continue to serve the market needs technology and performances wise. With the Vibe we didn’t want to develop just another console; we wanted to break new ground developing a completely new control surface based on what the modern user is familiar with – revolution, not evolution. The console received unanimous acclaim at the show, with users convinced that the time is right for this kind of interactive and adaptable approach to lighting control."